For those that are fashion conscious in this city, accidents are bound to happen to your designer handbags. A great handbag is an investment to your style and social life and needs to be cared for. Luckily, there are experts trained in professional purse cleaning, so your designer handbag can easily be restored to its original condition. Don't let a bag stain happen to a great bag. For those minor day-to-day mishaps, baby wipes are a great emergency spot clean technique. Baby wipes are a fantastic way to lift up drips and spots and help to ensure they don’t eventually set in. For those stains that can’t be blotted off or areas that have serious wear and tear to the material, it may take a lot of work to get it back to its original glory. When this happens, your best bet it to have it professionally restored. Because handbags and purses are created using delicate materials, they have to be cleaned by hand. When we receive your item our staff meticulously examines the entire handbag to determine how to move forward with the cleaning and restoration. Our expert bag restorer, Hassan, understands how to work with every type of fabric and finish. As far as stains go, there are two types: “water based” and “oil based”. We always test in a small area of the handbag to see how we need to approach the stain removal. 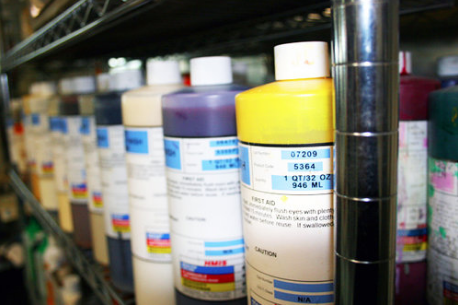 For water based stains, a cleaning agent is used. This wet approach works well for stains like food and various condiments. Our agents act as degreasers and lift out the lesser oily stains. Then we go over the spots with various tools to see if they can be brushed or scraped off. Careful precision and years of experience always help. Depending on the severity of the stain, or the fragility the material of the handbag, we may use a different approach towards the restoration. For stains like lipstick or say, salad dressing, bags will most likely need a bit of dry cleaning. For items like patent leather and vinyl, jeans pose a real threat to the finish of the material. 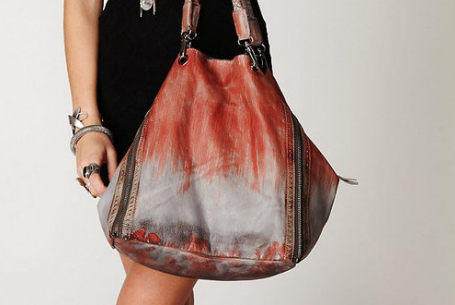 Dyes from jeans transfer onto handbags as you walk and typically don’t want to come out, especially from light colors such as cream or white. The best thing for this is preventative care. Be mindful of the materials you wear when going out and how they might affect one another. If you are wearing a new set of dark denim jeans, you definitely do not want to go out with light colored shoes or accessories. After we spot clean the handbag, we check for any open seams, tears, or any damage to the fabrics and skins of the handbag and carefully repair them. Call Meurice regarding leather bag restoration and stain removal. Next we meticulously match the leather finish to the original color of your handbag. If you go to your local store and try to purchase leather finish, your most likely going to find either black or maybe a cream, and there is no guarantee the colors will match your handbags original color. Our staff works with a rainbow of colors to ensure a proper match. 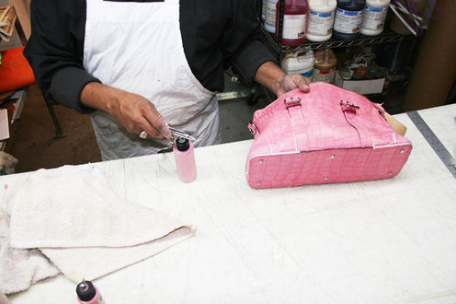 To get the handbag restored to its original beauty, it takes a lot of trial and error to get the colors just right. 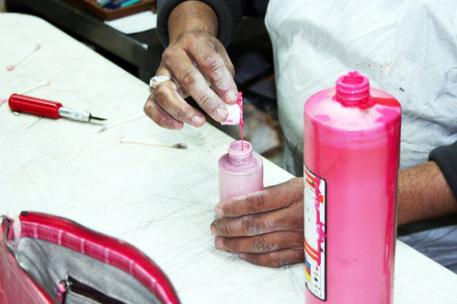 Our expert Hassan painstakingly matches the color so your handbag looks as good as when initially purchased it. Paint matching is a meticulous art that requires a lot of testing and experimentation. For this particular handbag, the tone had gradations from darker pink to lighter pink. To get this just right, Hassan will use various techniques like airbrushing to match the color. Airbrushing ensures proper bag restoration and color matching. After we have finished matching the color, the handbag is moisturized and hung to dry. A newly finished bag, restored to its original designer condition. Brilliant. The best care for your handbag is always preventative care. Be mindful of your surroundings when you go out. Watch out for areas where you rest your handbag. Be mindful off its contents as well. Ink, lipstick and other oil based products are difficult to get out, even at the hands of a professional. A simple way to keep the inside of your bag clean is to place all your ink or color-based utensils in a small makeup or pen/pencil case. For long term care, keep your bag moisturized with a non staining moisturizer. Remember, leather and suede are animal skins and will dry and crack if not looked after. Never store your handbag in an air tight plastic containers. Instead, store your purse in the muslin bag that it came with. This is imperative, as it will allow the fabric to breathe, keep it secure from dust, and importantly, protect it from any unintentional staining. If you’re in the NYC metro area, and interested in cleaning your designer handbag, please consider speaking to us at Meurice. We have locations downtown, Midtown, Manhasset Long Island.